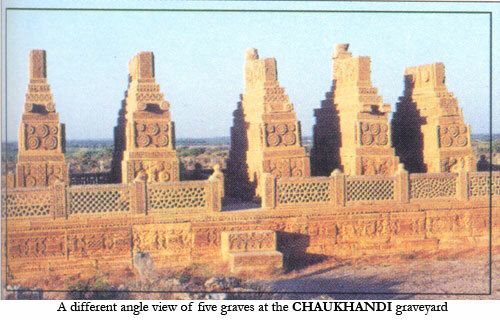 Chaukhandi Tombs are generally attributed to the Jokhio and Baloach Tribes of Sindh and were built between the fifteenth and nineteenth centuries A.D. Chaukhandi literally means four corners. 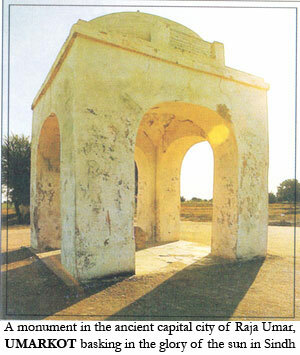 The tombs are built of yellow sand stone which were acquired from Jungshahi, a railway station near Thatta. The most impressive tombs are like Egyptian pyramid structures. They are rectangular in shape and are generally two and a half feet wide, five to eight feet long and four to fourteen feet high. The geometric designs that cover the entire surface of the tombs are extra ordinary. The intricate carving in geometric designs is unique and its delicacy gives the impression of wood carving. It is interesting to mention that the same designs are found in the textile pattern, jewellery and wood carving in Sindh and Balochistan today. The tombs of men are capped and stylized by turban and occasionally carved with horses, arms and weapons and the tombs of women have been decorated with most of the jewellery, such as anklets, bracelets, necklaces, rings and ear-pendants etc. 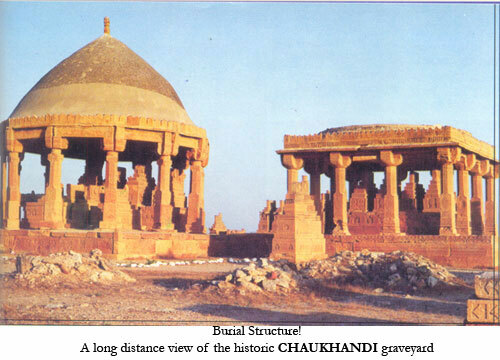 These tombs found only in Sindh and Balochistan can be seen along the Makran coast by the Indus river upto Sehwan. 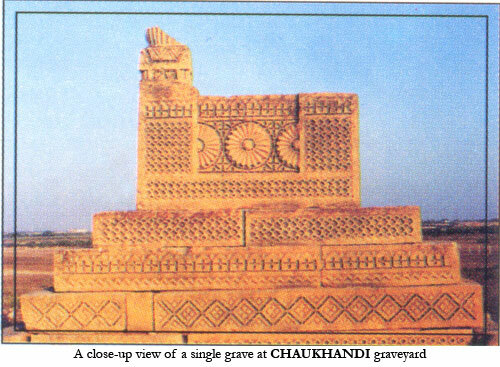 The most elaborately carved tombs are located at sites such as : Haidan, Lasbella and along the old trunk road at Malir, Dunblotte and Mirpur Sakro. The tombs have also been found on the east side of the Indus river at Gujjo, Tharriba, Sonda and Sehwan Sharif. 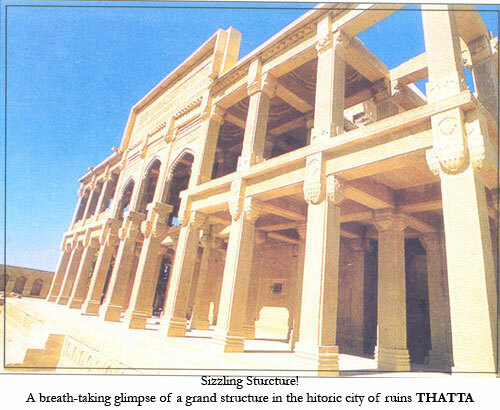 The Samma dynasty ruled over Sindh as an independent country for more than 190 years i.e. from 1333 to 1524 A.D. The reign of Jam Nizamuddin also known as Jam Nindo was not only the longest one (1461 – 1508), but is considered to be the most glorious period in the history of Sindh. He was a wise and just ruler under whom the educational as well as religious institutions flourished and people of Sindh enjoyed a long period of peace and prosperity. A huge treasure of history is buried in Makli Hills such as : graves of wise rulers, scholars and mystics, mosques and temples, swimming pools, educational institutions, manuscripts, recreation halls etc. Many theories have been put forward regarding the origin of Sammas. They are believed to be descendent of Sam, the eldest of the three surviving sons of the prophet Nuh (Noah). 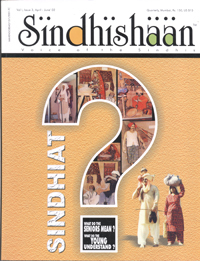 Some scholars are of the view that Sammas settled in Sindh as a result of mass migrations and movements of races and tribes from Central Asia. It is, therefore, believed that Sammas first lived on the fertile banks of the Indus, the Mighty River in 325 B.C., when Alexander, The Great, stepped into Sindh. It has also been mentioned by the historians of Alexander that Alexander, The Great was Sammo by caste. His capital was present Sehwan Sharif. 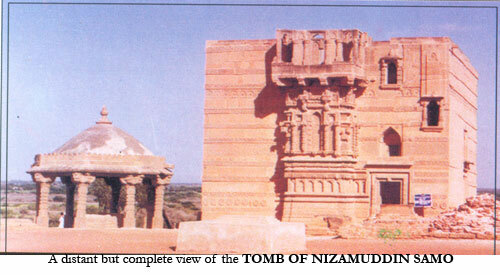 Jam Nizamuddin Sammo (Sultan Nizamuddin Shah) like other Samma rulers is also buried in Makli historical graveyard near Thatta. His tomb is an exemplary pattern of architecture. A row of birds, sun flowers, lotus arrangement on its walls as well as windows (Jharoka) show that Sindh has its glorious past even in the primitive ages.